Inscribed: …naqsha-i qudsiyya bagh dar … vali ‘ahd bahadur. ‘amal-i Mazhar ‘Ali Khan. 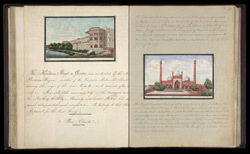 The Koodseea (‘Pure, Chaste’) Bagh or Garden was constructed by the Newab Koodseea Begum, mother of the Emperor Mohumud Shah during the reign of her son -p. 12- [f.15] and named after herself. It is situated immediately in the environs and to the North of the city. Formerly a splendid palace, has now much dilapidated and neglected. It belongs to the heir apparent in the time being. The Zeenut ool Musajed or Ornament Mosque was erected by the Zeenut ool Nissa, a daughter of the Emperor Aurungzebe who reigned between the years 1659 and 1707 A.D. of our Lord. It is red stone with inlayings of marble with a spacious terrace in front, and a capacious reservoir faced with marble. It is considerably elevated and stands close to the River Gate of the city. Inscribed: naqsha-i zinat al-masajid nazd-i kothi-i Ahmad Bakhsh Khan. The Royal founder having determined on a life of celibacy, laid out a large sum of money in the above mosque and on its completion she constructed a sepulchre of white marble surrounded by a wall of the same costly material on the west avenue of the terrace. Here she was buried AD 1710. Formerly lands yielding an annual revenue of 100,000 Rs=10,000£ of our money, were allotted for the support of the priests and servants and the repairs of the building, but they have long since been alienated.